Green Souls Earth Day Cleanup. Join us and thousands of other volunteers at the Anacostia Watershed Society’s annual cleanup of DC parks, streams, and the Anacostia River. Registration is required in advance; contact Emily (koester.emily@gmail.com) by Apr. 9. Sat., Apr. 13, 9:00 am – 12:00 noon. All Souls Intergenerational Seder. For more info, contact stevennr@verizon.net. 5:00 pm, Pierce Hall. Dangerous Hope . Rev. Parker. Creation is at risk. Enormous changes are needed, but many forces of resistance stand in the way. It can be dangerous to hope—as the people who followed Jesus learned, long ago. They welcomed him into Jerusalem with joyful hope on Palm Sunday and witnessed his crucifixion a few days later. What forces of resistance killed Jesus? What “crucifying powers” are putting creation at risk today? How do we grapple with resistance as we seek to courageously participate in creating a just and sustainable world now? 9:30 and 11:15 am, sanctuary. Mindful Souls provides an opportunity to meet in community regularly at the church for meditation, followed by discussion led by congregants or others from our broader DC community. We welcome all who wish to attend. Every Sunday, 11:00 am, library; 1:00 pm, classroom 2. THIS SUNDAY: No 11:00 am session - join us at 1:00 pm for a Mindful Souls community potluck instead! Church closed for DC Emancipation Day . The Kindred Spirits Men’s Group invites interested men to this salon, every third Tuesday of the month, where dialogue flows and we deepen our connections as All Souls Unitarian men. Contact Philip Smith ( philips442@gmail.com ) to RSVP and get more info. 7:15 - 9:00 pm, at a member’s home near All Souls. Souls in the Center Have a Happy Hour . A good way to get to know people in a small-group setting. Get your dose of our newly discovered warmth and sunshine. New venue and new start time! 6:30 pm, The Wonderland Ballroom (1101 Kenyon St NW). Discovering the Wisdom of Your Dreams . All dreams come in the service of health & wholeness. While only the dreamer can say with any certainty what meanings their dream may hold, each of us is also uniquely blind to some of the meanings of our dreams. Dream work with others can help us discern the gifts that are just below the surface. Contact Rev. Dave MacMillan ( dmacmillan@uuma.org ). Drop-in intro session on April 18. Thursdays, April 18, 25, May 2, 9; 6:30-7:30 pm. 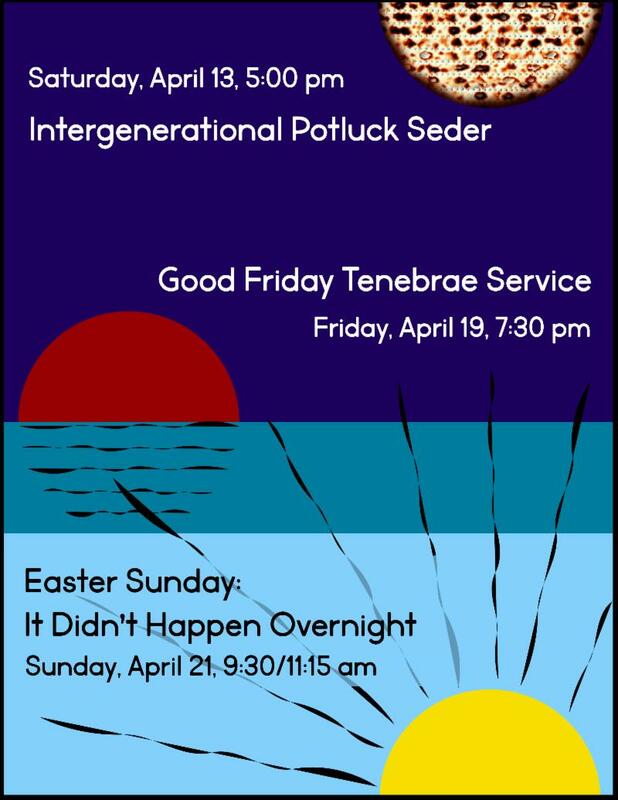 Good Friday Tenebrae Service . 7:30 pm, sanctuary. Contemplative Practices Retreat . In this half-day retreat, we will honor Hindu religious perspectives and devotional practices as well as the power of interfaith spirituality and its expression. We’ll explore the practices of sitting and walking meditation, mindful eating, prayer, ritual, and silence, and explore other modes of spiritual reflection known to facilitate compassion, well-being, and exquisite self-care. With Revs. Joanne Braxton and Abhi Janamanchi. Register here . 10:00 am – 1:00 pm, Cedar Lane UU Church. Souls in the Center Have a Game Day. Bring your favorite board game and join us at a new location this month. Contact Elyte ( elyte.baykun@gmail.com ). 2:00 - 5:00 pm, Marx Cafe (3203 Mt. Pleasant St. NW). 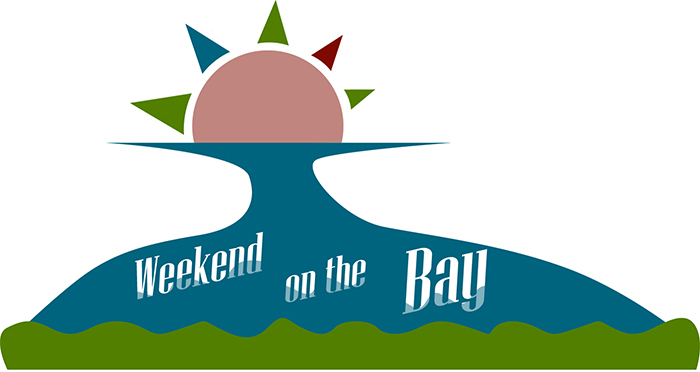 Calling All Souls of All Ages to Weekend on the Bay! Early bird (reduced rate) registration is open! NEW THIS YEAR: Flat-rate pricing, with lodging matched to your party’s needs on a first come, first served basis. Sign up early! As we move through this process, we will share periodic updates with members of the congregation. Writing for Healing. This workshop offers an exploration of the writer’s craft as a tool-chest for witnessing and extending compassion to the self and others. Though primarily an autobiographical writing class, participants learn such practices such as mindful journaling, spiritual life writing, sitting meditation, and the creation of rituals and other forms of expression and meaning-making that support recovery and resilience through transformative healing. This can be particularly good for those suffering from injury, illness, grief, or loss, but the techniques learned are invaluable to anyone who wishes to honor their experience or the experience of others. Instructor: Rev. Dr. Joanne Braxton. Fee: $10. Thursdays, May 2 and 16, 7:00—9:00 pm. Opening to the Great Transition . We have entered a time of unprecedented change and profound choice. Climate change, wealth divisions, species extinction, overpopulation, and accelerating technology are shaping a world beyond our comprehension. Coming together in community, in a context that supports us in our wholeness, offers spiritually informed perspectives, and makes space for our feelings, can help us face this great transition. This experiential one-day workshop, using immersive exercises, dialogue, guided meditation, videos, journaling, grief work, and more, will deepen our understanding and acceptance of the challenges ahead. Early registration $80, full-time students $35 . Sat., May 4, 9:00 am - 5:30 pm, Eaton Room. Discovering the Wisdom of Your Dreams. All dreams come in the service of health & wholeness. While only the dreamer can say with any certainty what meanings their dream may hold, each of us is also uniquely blind to some of the meanings of our dreams. Dream work with others can help us discern the gifts that are just below the surface. 6:30 to 7:30p Thursdays April 18, 25, May 2, 9. Drop-in intro session on April 18. Contact Rev. Dave MacMillan ( dmacmillan@uuma.org ). Frederick Douglass . Although a member of the African Methodist Episcopal Zion Church for most of his life (and later Metropolitan A.M.E. here in DC), abolitionist and statesman Douglass was drawn to religious liberalism and often attended All Souls. Douglass was himself a preacher and his preacherly style informs his best-known text, Narrative of the Life of Frederick Douglass, an American Slave: Written by Himself). We’ll discuss the life and work of this great leader and consider what message it holds for us today. Facilitator: Rev. Joanne Braxton. May 1 and 15. Annual All Souls Seder: Saturday, April 13th at 5pm. The plagues, the matzoh, the Red Sea, oh my!! Interactive and educational fun for all ages. Earth Day Cleanup with Anacostia Watershed Society. Family friendly activity on April 13th from 9a-12p. For more information, contact koester.emily@gmail.com . 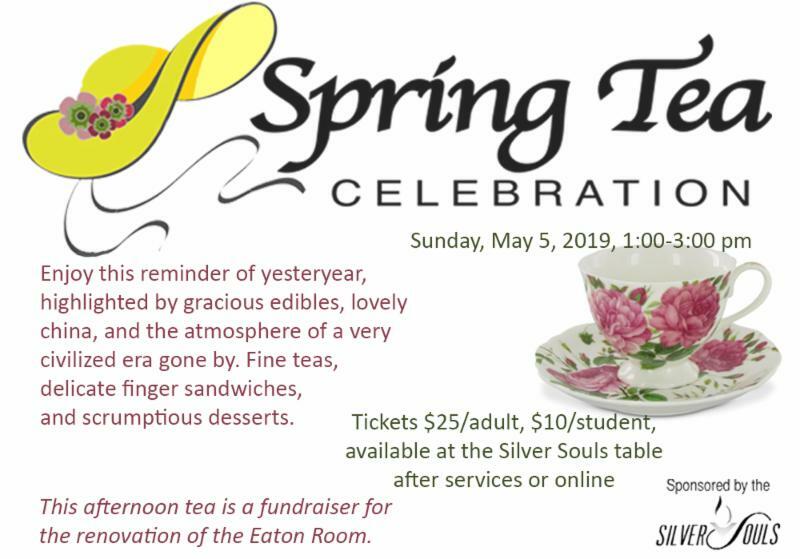 The Silver Souls are looking for children and teens to share a talent (instrument, reading, dance, modeling…) during “High Tea” on Sunday, May 5thbetween 1-3pm. Contact Sonia Moore-Williams if interested. smoorewilliams@gmail.com or 340-643-0994. Easter Sunday, April 21st - Special entertainment by “Juggling Magician” during both services, for children K & up. Younger children are welcome with a parent/guardian. Seeking “chaperones”. Contact dmiller@allsouls.ws (202-517-1469) if you can help. Annual Sunday Egg Hunt following both services (April 21st) on the Playground. Eggs contain tickets that can be exchanged for a wide array of prizes. So Others Might Eat supports homeless individuals, including training and employment readiness. They need professional attire (particularly men’s). Bring your clothing donations to church between now and April 28. Julia Moran Morton ( jmoranmorton@gmail.com ) will collect and transport to SOME for its Professional Day. Get trained to support Rosa in sanctuary at Cedar Lane . Our friends at Cedar Lane UU Church in Bethesda have been providing physical sanctuary for Rosa Gutierrez Lopez since December 10 and they need our help to continue this work. There are two upcoming trainings for volunteers who can assist with daytime and nighttime companionship (4-hour shifts), driving, or weekend/holiday companionship for Rosa’s children. RSVP required . Contact Denise Woods ( woodsassoc@gmail.com ). Apr. 27, 9-11 am, or Apr. 30, 7-9 pm, at Cedar Lane UU. Looking for an opportunity to serve? The ASC Haiti Committee is looking for volunteers with all kinds of skills sets. With financing from ASC Beckner Fund and technical support of UMD MIS faculty and students, CEN is creating a Community Development Marketplace online platform for direct networking between the providers and the seekers of project assistance in Haiti. The marketplace, an online searchable database, is meant to educate donors, primarily Haitians living abroad, about priorities and facilitate direct fundraising around the world, as well as facilitating information sharing, and network building. Visit ASC website and CENHaiti.org for more info about the ASC Haiti committee and CEN Haiti Program.” Soft Launch date Fall 2019 at the Haitian Embassy. Please contact Armele Vilceus ( Arvilceus@gmail.com ) or Ralph Belton ( Board.cenhaiti@gmail.com ). All Souls’ Beckner Advancement Fund is recruiting three new committee members to join the committee in August 2019. The Beckner Advancement Fund is a social justice philanthropic initiative housed within All Souls Church Unitarian. All Souls members Earl and Meta Beckner endowed the Beckner Advancement Fund in 1973 to create a more collaborative, attractive, and forward-looking community that fosters human rights and dignity and enhances the influence of All Souls Church in the Washington metropolitan area. We carry out this vision through internal and external grants of about $70,000 each year to support efforts that advance All Souls’ social justice mission. We welcome all applicants with a passion for philanthropy, equity, and justice. We are especially interested in applicants with experience/expertise in any of the following areas: social media, communications, training and facilitation, and/or community outreach. The application can be accessed here . Applications are due by Tue., April 30. Selected applicants will be notified no later than June 1. Find out more about our work at www.all-souls.org/beckner . Annual Mother’s Day Plant Sale seeks a Coordinator. Over 30 years ago, Bob and Molly Freeman initiated the first All Souls Mother’s Day Plant Sale. Under their auspices, it grew and became an anticipated annual tradition. Now it’s time to pass the torch to other plant lovers. We seek someone (or several someones!) to organize volunteers to grow and donate plants, set deadlines for plants to be brought to the church, organize the setup of the courtyard the day before the sale, and supervise the sale. It’s a fairly simple process; it just needs a dedicated person to lead the way. Minimal time is required January to March (such as reserving the courtyard and recruiting volunteers). In April, advertising begins in earnest, with an information table in Pierce Hall to solicit volunteers to grow and donate plants and pots. This can be a short-term volunteer opportunity (3 months) or it can become your new annual service project. Don’t let this grand tradition of sustainability fade away! Contact Pam Amos (pfamos@gmail.com) to learn more and get involved today. Help us make our music and preaching sound even better, both in the sanctuary and for those who listen at home when they can’t get to church. We’ve just installed a brand-new state-of-the-art sound system, and we want YOU to be a part of the Sound and Tech Team ! We’re looking for a team of enthusiasts to help run sound for Sunday services and other events. You should be a team player, willing to learn, and able to commit to a regular schedule (perhaps one Sunday every month or six weeks). Experience with live or studio sound recording is a bonus, but not required. For more info, contact Director of Music and Arts Jen Hayman (jhayman@allsouls.ws). A Sunday-Morning-Only Volunteer Job with Great Benefits. You’ve seen the Caring Card Table in Pierce Hall every Sunday; many of you come to sign the cards displayed there. Many of you have received the cards – of congratulations, condolence, get well, thinking of you, and more, all signed by All Souls congregants on Sunday morning. The cards are a missive of love to those among us. People who receive a card tell us that they very much appreciated the special outreach to them. We want and need a few more volunteers to give an hour at the Caring Card Table on Sundays whenever your schedule permits. There is no set schedule that you must adhere to. All details will be given to you in advance of your starting. Please help us continue the outreach and connection ministry that people appreciate so much. For details, contact Marianne Anderson (703-582-6811; marianneanderson.1224@yahoo.com).